Liverpool have now won five games out of five at the start of the season by beating Tottenham 2-1 at Wembley this afternoon. 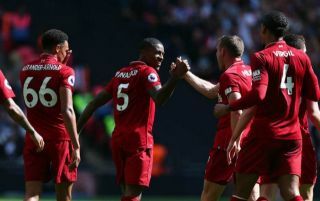 The Reds are living up to their billing as the most realistic contenders to challenge last season’s runaway champions Manchester City for the Premier League title this term. Liverpool are chasing a first league title since all the way back in 1990 and many think this is their most realistic shout yet since that year. It’s been a long and difficult wait for LFC, who have never made as good a start as this in the Premier League era, and indeed have only ever twice before won all five of their opening five fixtures. According to this tweet below from Opta, the Merseyside giants last did this in 1990/91, and then did it once before that in the 1978/79 season. As well as that, this is now a record-breaking fixture in the Premier League, with no two teams providing more goals in meetings between them than Liverpool and Spurs.